My husband asked me the last time we moved why I no longer hang up all the family photos in the hallway. You know the display. It looks like your Aunt Gertrude’s house with all the 8×10 frames filled with outdated school pics. These days it’s much more chic to find more creative ways to display your photos. You may remember my very first post here on Craft Gossip, these fabulous picture knob plaques. I’ve collected a few other ideas from the blogosphere you might like too. 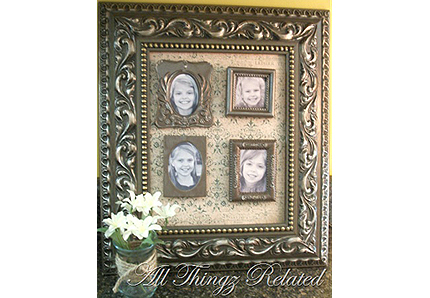 1) Shabby Frame Door Photo Holder – The first one you see pictured above was made from an old miniature door. Jen from Craft-o-Maniac will show you how she took this door from drab to fab. 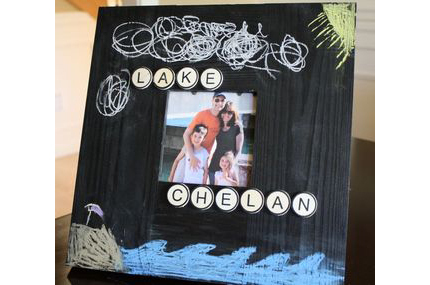 2) Chalkboard Family Frame – I came across this cute project from Yesterday on Tuesday. She took a cheap frame, painted it with chalkboard paint, then used some circle letters to decorate it. Get the tutorial here. 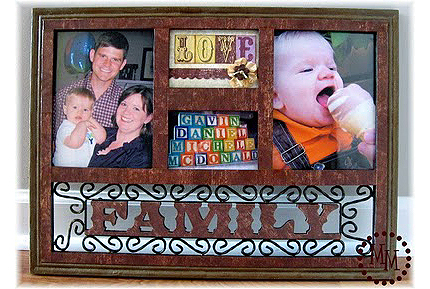 3) Family Frame Makeover – Michele from The Scrap Shoppe took a frame that most would consider read to go and made it her own. See the tutorial for this family frame makeover. 4) Cabinet Door Photo Displays – I love how Beans and Buttons took old cabinet doors and upcycled them into great photo displays. See how she did it here. 5) Photo Tiles – Over at the blog Let’s Make It Ours, you can get the how to on making your own photo tiles, these make wonderful gifts! 6) Credit Card Mosaic Frame – This project was created as a mirror but could easily be adapted to a picture frame. 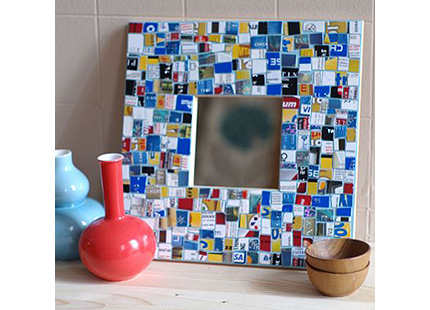 See how to take old credit cards to make a mosaic frame over at Fine Craft Guild. 7) Stenciled Teen Frame – if you are looking for a more kid friendly frame, I made this from a $100 wooden frame and a frame stencil for my daughter’s friend. This is a great project for kids! 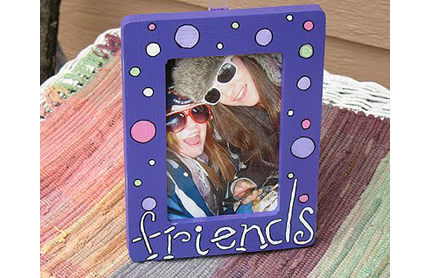 See the stenciled frame tutorial on Crafts by Amanda. 8) Frames Within a Frame – All Thingz Related took an old mirror, jazzed up the frame, inserted some pretty vintage page, then hung mini frames inside. Check out the how to here. 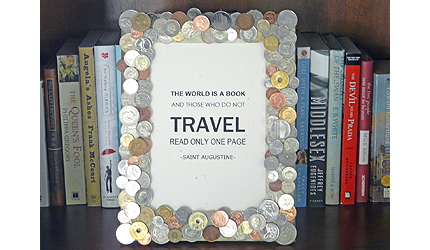 9) Coin Frame – This great idea comes from Bliss Bloom Blog. They’ll show you how to shine up your coins with ketchup before adding them to your frame. See the coin frame here. 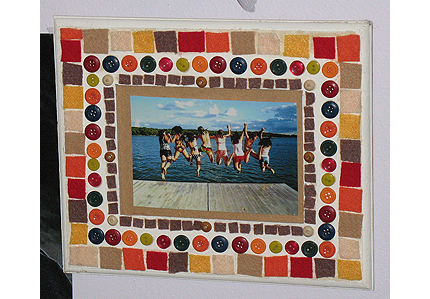 10) Mosaic Family Frame – This is one of my favorite frames. I made this for Kaboose’s fall crafts section a couple of years ago. My daughter has it hanging in her room with a picture of her and all her friends jumping into the lake here in town. You can get the how to on this mosaic frame on Kaboose. 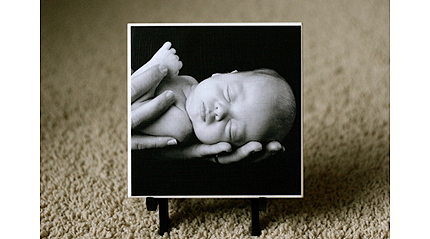 Do you know of a cool way to display photos or maybe a fun and unique frame project? Leave it in the comments or send it my way! Thanks so much for the mention Amanda! LOVE the site! !